The Efest LUC V6 Six Bay Smart Battery Charger is one edition of the extremely popular LUC series, combining Efest's vaunted intelligent charging hardware with an expanded six slot battery bay, the capability to simultaneously charge six batteries at 0.68A each as well as a maximum output of 2A for two slots. Compatible with a wide range of 3.6V/3.7V lithium batteries used in electronics cigarettes, flashlights, electric tools, instruments, meters and more. 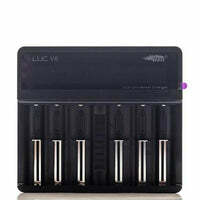 LUC V6 Charger - Efest has a rating of 5.0 stars based on 2 reviews.